Reading candlestick charts is an effective way to study the emotions of other traders and to interpret price. Candles provide a trader with a picture of human emotions that are used to make buy and sell decisions. There is nothing on a chart that matters more than price. Everything else is secondary. Take that piece of paper and tape it to the top of your monitor! I think too often swing traders get caught up in so many other forms of technical analysis that they miss the most important thing on a chart. You do not need anything else on a stock chart but the candles themselves to be a successful swing trader! And, there is nothing that can improve your trading more than learning the art of reading candlestick charts. Believe it. There are only two groups of people in the stock market. There are buyers and sellers. We want to find out which group is in control of the price action now. We use candles to figure that out. The picture above shows how candlesticks are constructed. The highs and lows of the time period are called the "wicks" and the open and close form the "body". The candle itself is the "range". When stocks close at the bottom of the range we conclude that the sellers are in control. When stocks close at the top of the range we conclude that buyers are in control. Note: In the stock market, for every buyer there has to be a seller and for every seller there has to be a buyer. If a stock closes at the top of the range, this means that buyers were more aggressive and were willing to get in at any price. The sellers were only willing to sell at higher prices. This causes the stock to move up. If a stock closes at the bottom of the range, this means that sellers were more aggressive and were willing to get out at any price. The buyers were only willing to buy at lower prices. This causes the stock to move down. Where a stock closes in relation to the range tells us who is winning the war between buyers and sellers. This is the most important thing to know when reading candlestick charts. We can classify candles in two categories: wide range candles (WRC) and narrow range candles (NRC). Wide range candles state that there is high volatility (interest in the stock) and narrow range candles state that there is low volatility (little interest in the stock). The arrows on the chart below show how stocks move in relation to the range and closing prices. You'll notice that stocks tend to move in the direction of wide range candles. This is important! If we know that stocks tend to move in the direction of wide range candles, we can look to the left of any chart to gauge the interest of either the buyers or sellers and trade in the direction of the trend and the candles. The importance of this cannot be overstated! You want to know if there is interest in the stock and if it is being accumulated or distributed by institutional traders. Low volatility leads to high volatility and high volatility leads to low volatility. So, knowing this, doesn't it make sense to enter a stock in periods of low volatility and exit a stock in periods of high volatility? Yes. What about hammers, doji's and shooting stars? I know what you're thinking. You thought this page was going to be about hammers, doji's, and shooting stars. Sorry to disappoint you, but knowing all of the different types of candlestick patterns is really not at all necessary once you understand why a candle represents the struggle between buyers and sellers. 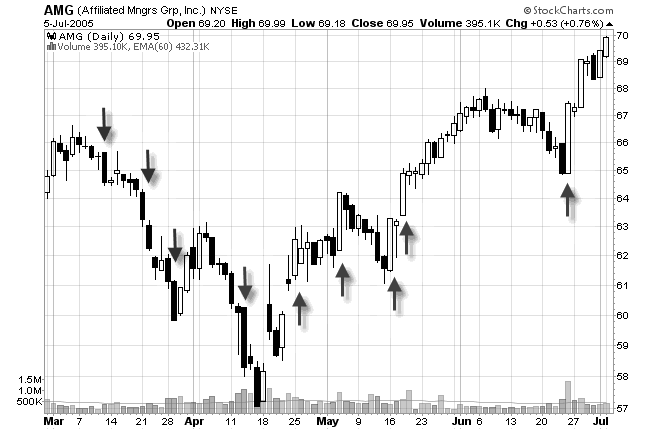 In the picture to the right, we see a classic candlestick pattern called a hammer. What happened to cause this? The stock opened, then at some point the sellers took control of the stock and pushed it lower. Many traders were shorting this stock thinking it was headed lower. But by the end of the day, the buyers took control, forced those short sellers to cover their positions, and the stock had enough strength to close the stock at the top of the range. So, this is obviously very bullish! When we are reading candlestick charts, why would we need to know the name of the pattern? What we do need to know is why the candle looks the way that it does rather than spending our time memorizing candlestick patterns! Want to learn more about reading candlestick charts? Get the book Japanese Candlestick Charting Techniques by Steve Nison. This is the best reference book on the market and the only one you will ever need to buy. This book is not just about memorizing candlestick patterns. This book is about price action and the psychology behind stock movement. These two components are absolutely critical to your success as a swing trader!